GENSOUL, Adrien Robert (1823-1877), emigrated from Paris, France to California on the Medicis in 1850 at the age of 27. 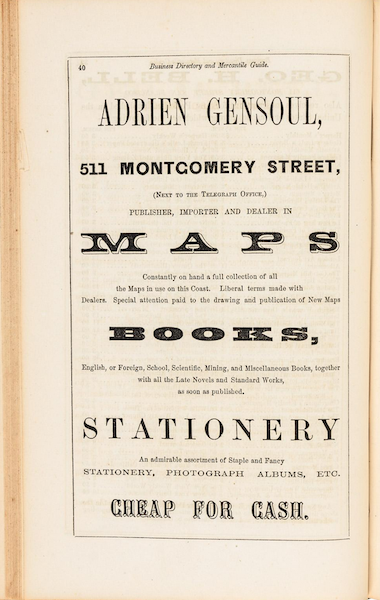 Gensoul was a well-known San Francisco book dealer and importer of fine goods. He imported prints, photographs and art supplies, and was a frame manufacturer in San Francisco, active c. 1861- c. 1865. Adrien Gensoul died December 31, 1877. He was originally buried in Calvary Cemetery, San Francisco. When the remains of some 40,000 graves were removed and relocated, Gensoul is though to have been transferred to burial in a large unmarked mound in Holy Cross Catholic Cemetery, Colma, CA. This page was last edited on 28 July 2018, at 11:31.